Sunset Park is a neighborhood in the western part of the New York City borough of Brooklyn. It is bounded by the Gowanus Expressway/17th Street, Park Slope, Greenwood Heights and Green-Wood Cemetery to the north, 8th Avenue and Borough Park to the east, 65th Street and Bay Ridge to the south, and Upper New York Bay to the west. Because it was once close to the southern boundary of the City of Brooklyn, Sunset Park is considered to be part of South Brooklyn. However, until the 1960s, the northern part of Sunset Park was considered to be part of Gowanus, and the southern part was included in Bay Ridge. The neighborhood received its own name in that decade. The 24.5-acre (9.9 ha) public Sunset Park, for which the neighborhood was named, was founded in the 1890s, and is located between 41st and 44th Streets and 5th and 7th Avenues. The park&apos;s elevated location offers views of New York Harbor; Manhattan; the Statue of Liberty; and, more distantly, the hills of Staten Island and New Jersey. Said to be one of Brooklyn&apos;s "most heterogeneous neighborhoods", Sunset Park&apos;s population is composed of Puerto Ricans, Mexicans and other Hispanics, in addition to Chinese, Indians and Norwegians. The core of the Hispanic population is west of 5th Avenue, while the center of the Chinese population – now referred to as Brooklyn&apos;s Chinatown – is from 7th Avenue east to Borough Park. The area between 5th and 7th Avenues is mostly mixed. The ethnic diversity of the neighborhood is celebrated annually with the Sunset Park Parade of Flags down 5th Avenue. The neighborhood is part of Community Board 7, and served by the New York City Police Department&apos;s 72nd Precinct. Fire services are provided by Engine Company 201, Engine Company 228 and Ladder Company 114. The Brooklyn Public Library has a branch located on 4th Avenue at 51st Street. The area is also home to the Jackie Gleason Bus Depot, named after the actor who played bus driver "Ralph Kramden" in the long-running TV series The Honeymooners. Outside of it stands a statue of Gleason dressed as Kramden. In February 2016, Sunset Park West was one of four neighborhoods featured in an article in The New York Times about "New York’s Next Hot Neighborhoods". Six New York City Bus bus lines serve Sunset Park: B9, B11, B35, B37, B63, B70. Three subway lines run through Sunset Park. The BMT Fourth Avenue Line (D N R) has stations at 25th Street, 36th Street, 45th Street, 53rd Street and 59th Street. The BMT West End Line (D) has a station at Ninth Avenue. The BMT Sea Beach Line (N) has two stations in Sunset Park, at Eighth Avenue and at Fort Hamilton Parkway. For some time, SeaStreak service was available at the Brooklyn Army Terminal to Pier 11/Wall Street, the East 34th Street Ferry Landing, the Sandy Hook Bay Marina, or Riis Landing on summer Fridays. Ferry service was created in the aftermath of the September 11th attacks when the Gowanus Expressway and New York City Subway were at capacity. It was free from October 2001 until April 2003, when the Federal Emergency Management Agency announced that it could not subsidize the service anymore. Then, until 2011 it was operated by the Red Hook, Brooklyn-based New York Water Taxi company on its Rockaway/Sandy Hook route. The Water Taxi service from the Brooklyn Army Terminal was part of the crucial contingency plan during the 2005 New York City transit strike. Much of the traffic between the Brooklyn and Manhattan Chinatowns is handled by privately held minibuses known in Chinese as "VAN 仔" and in English as "Chinese vans". Greenwood Heights is a mixed neighborhood of Hispanics, older Polish American and Italian American families, Chinese, Black, and middle class Brooklynites who have relocated from other higher-priced neighborhoods. Recent new real estate development, curbed with the rezoning of the area in November 2005, has brought an influx of luxury condominium apartments into a residential area that was mainly made up of 1- and 2-family homes. Post-rezoning, while new development sites have occurred, there has been a new trend of home renovations (many of them "gut renovations"), taking many of the neglected c. 1900 wood frame homes and restoring them to their turn of the 20th century historical look. Like many parts of the city, the neighborhood is changing: in recent years, new businesses and eateries have opened, including J&apos;eat Jet? and long-standing independent businesses have closed, including Eagle Provisions, Has Beans, and Balance Life. The neighborhood is served by the 36th Street, 25th Street, and Prospect Avenue stations on the New York City Subway&apos;s BMT Fourth Avenue Line, served by the D N R trains. Greenwood Heights&apos; architectural mix of wood frame, vinyl sided and brick homes gives the area an eclectic look and feel, different from its neighbors Park Slope to the north and Sunset Park to the south. It has a primary school, Public School 172. In 1995, Al-Noor School, an Private school teaching Arabic and Islamic culture was established on between 20th and 21st street on 4th avenue. Borough Park (also spelled Boro Park) is a neighborhood in the southwestern part of the borough of Brooklyn, in New York City in the United States. The neighborhood covers an extensive grid of streets between Bensonhurst to the south, Bay Ridge to the southwest, Sunset Park to the west, Kensington to the northeast, Flatbush to the east, and Midwood to the southeast. Borough Park is home to one of the largest Orthodox Jewish communities outside of Israel, with one of the largest concentrations of Jews in the United States, and Orthodox traditions rivaling many insular communities. As the average number of children in Hasidic and Hareidi families is 6.72, Borough Park is experiencing a sharp growth in population. It is an economically diverse neighborhood. Originally, the area was called Blythebourne, a small hamlet composed of cottages built and developed in 1887 by Electus Litchfield, and then expanded with more housing by developer William Reynolds. It was served by the Brooklyn, Bath and Coney Island, a steam railroad that is today&apos;s elevated BMT West End Line; the line ran from Greenwood Cemetery to Coney Island when it was built in the 1860s. This line was put on an elevated structure in 1917. 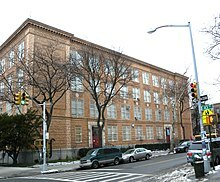 The New York City Department of Education operates Borough Park&apos;s public schools; NYCDOE&apos;s District 20 covers Borough Park. P.S./I.S. 180 Homewood School, a zoned public K-8 school, receives many bused-in students from other neighborhoods, including Bay Ridge and Bensonhurst. Many elementary schools have had mixed results from this student drain; for example, in 2004, a New York Times reporter stated that Public School 164 was "at only 89 percent of capacity because many children in the community attend yeshivas. Classes are small, the hallways quiet, the principal and assistant principal know every student by name." Subsequently, the percentage of children reading at or above the grade level has increased to 55% in 2004 from 40% in 1998 in an otherwise unchanged school. Most Borough Park neighborhood parents send children to Jewish private schools (called yeshivot). In fact, virtually all the large population of school-children born into Borough Park&apos;s Hasidic families attend local yeshivas for boys and Bais Yaakov-type schools for girls. This had diminished the student population of local schools, such as The Montauk Intermediate School. The New York City Department of Education hoped to take advantage of the empty space and construct a small school, called the Kingsborough Early College School, inside Montauk. The Hasidic community was not pleased by the prospect of a new public school because it would bring "a bad element" (a supposed euphemism for immodestly attired girls), and protested the decision. The Community Educational Council heard these complaints and decided against expanding its public school system. Instead, an all girls 6-12 school, the Urban Assembly for School for Criminal Justice moved in, and occupies part of the 3rd floor and the entire 4th floor of the building with its over 500 girls. In addition, The Montauk School now serves mostly Asian students; and nearly a third of its nearly 1000 students are English as a New Language students. Together, the schools service nearly 1600 students, above the target capacity of 1422 students. The B8, B9, B11, B16, B35 New York City Bus routes serve the area, as well as the private B110 bus route to the predominantly Jewish neighborhood of Williamsburg. The New York City Subway&apos;s BMT West End Line, serving the D train, is at 55th Street, 50th Street, and Fort Hamilton Parkway. The IND Culver Line, serving the F train, runs along McDonald Avenue, the eastern border of Borough Park. The BMT Sea Beach Line on the N service also serves the neighborhood at Fort Hamilton Parkway. Borough Parks major avenues run north south, and run against Greenwood Cemetery. Its major shopping districts are 13th Avenue, 16th Avenue and 18th Avenue. Maimonides Medical Center has 679 beds, a full ER with a level 2 trauma center, maturity wards, and Psychiatric services. It includes a large outpatient clinics program and is a major teaching hospital in the state of New York.